Dr. David Byington studied biology at Lake Superior State University. He received his Bachelor’s degree from Michigan State University and his medical degree from Michigan State University’s College of Osteopathic Medicine. He completed his internship at Mt. Clemens General Hospital and his residency training at Lansing General Hospital through MSUCOM’s Family Practice Residency program. 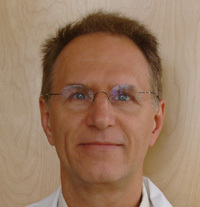 He is certified by the American Osteopathic Board of Family Practice and has been in private practice since 1989. He lives in the Grand Rapids area with his wife, Elizabeth, and enjoys bicycle riding, general fitness, reading, computer programming, and playing guitar.